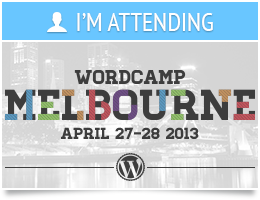 It’s been two years since I helped organise WordCamp Melbourne 2011. Time flies! The good news is that WordCamp Melbourne 2013 has been scheduled for April 27-28 2013. WordCamp is a conference for WordPress enthusiasts, designers, developers, or anyone who is using WordPress for business or pleasure. This year’s conference is being organised by a fantastic group of people, and they’re going to be putting on a fantastic WordCamp. The speaker list and schedule is jam-packed, and the venue is in the CBD so it’s easy to get to. So if you’re in (or near) Melbourne, I’d definitely recommend coming along. Best of all, tickets are only $50 for two full days of WordPress goodness! WordCamp Melbourne 2011 was last weekend, and there is a wrap-up of it on the WordCast Podcast episode 92. Kym Huynh attended the event and interviewed some of the attendees. I’ll be posting my own summary of WordCamp Melbourne 2011 in the coming days. With WordCamp Melbourne 2011 only 2 weeks away, the schedule has been announced. There are approximately 15 presentations on the first day, and 5 workshops running on the second day. Ticket sales for WordCamp Melbourne 2011 are now on sale. WordCamp brings together bloggers, designers, developers and anyone who uses the open source WordPress publishing platform for their professional or personal projects. Come along to hear speakers, participate in panels and discussions, learn about what people are doing with WordPress and share your own projects and passions. You do not need to be a super experienced WordPress developer – you don’t need to be a developer at all. We’ll be talking about how bloggers can blog better using WordPress, as well as talking about all the backend stuff which WordPress developers do too. The event is on the weekend of 26-27th February 2011 at the North Melbourne Town Hall. If you are interested in WordPress, I strongly recommend attending. I attended WordCamp Sydney in 2008, and I learnt a lot. But more importantly, I met a lot of interesting people who I am still in contact with today. I am one of the organisers of WordCamp Melbourne, and the event is shaping up to be a fantastic event. We’d also love to hear from you if you are interested in speaking at the event. We are planning on having two streams – blogging/content and technical/developer. Visit the WordCamp Melbourne 2011 website for more information or to purchase tickets. Last week I attended the 2010 Open Source Developer’s Conference at Melbourne’s Abbotsford Convent.